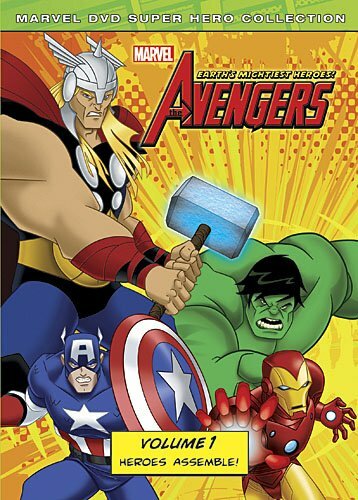 The AVENGERS: Earth's Mightiest Heroes! started airing back in October 2010, and I must admit I completely missed this series, mostly likely because it apparently was shown on Disney XD, which I don't frequent too often. Now that it's on DVD, I had a chance to check out both volume 1 and volume 2, which make up the first half of the first season. And I really like it. There is a noticeable anime-influence to both the animation and in the use of a story arc, instead of having standalone stories for each episodes. Each of the first five episodes focus on a single superhero, be it Iron Man, Thor, Hulk, Captain America, or Ant Man and Wasp. I was expecting the first episode to start out with either the Avengers already assembled as a team or showing how them coming together as a team, so I was pleasantly surprised to find that they didn't rush and instead focused on individual characters, which really does make the heart of any series. It's not until episode eight that the heroes actually start to form their team, and even then it takes a while for them all to click. I also really liked the fact that as we start the series, pretty much all the super villains are already locked up. That felt completely upside down from typical superhero shows, and means that there are a whole lot of villains that are already established, so our heroes shouldn't be needing introductions to them or rolling their eyes while hearing the bad guys monologue about their origins. Of course, what fun would it be if all the villains are locked up, so obviously they escape, but this is also cool because it's not just one jailbreak after another, it's all of them escaping at once. With a whole load of super powered evil beings on the loose and only a handful of superheroes, it provides an extremely valid reason for the heroes to join forces rather than going at it alone. Our heroes here are also more than just heroes, they're also people, with individual personalities and realistic internal conflicts. For instance, The Hulk struggles with the feeling that he is a monster more than a man, and Captain America struggles with the fact that his sidekick died saving his life and that he feels like a relic of the past in this new present day. Don't get me wrong, it's not all drama, there is a lot of action here too, it's just nice to be able to feel for these characters. There is only one bonus feature on the DVD, which is a sneak peak of season 2, but it's not just a clip of season 2, it's the producers talking about the show and what they wanted to do and change in the next season. It's only like seven and a half minutes long, but was much more interesting that I expected so I'm glad I didn't skip over it. Anyway, I'd definitely recommend checking this show out.